We offer training for all dogs – big or small. Please see our Partners page for information on Steve & Vicki Austin who we have formed a partnership with. With a wealth of information between Steve & Vicki we are sure all humans with behaviour or training concerns can be helped. Dog trainer classes are now being held here – please click to see Steve & Vicki’s Page. Jenny is very passionate about the health and well being of animals, both mental and physical. 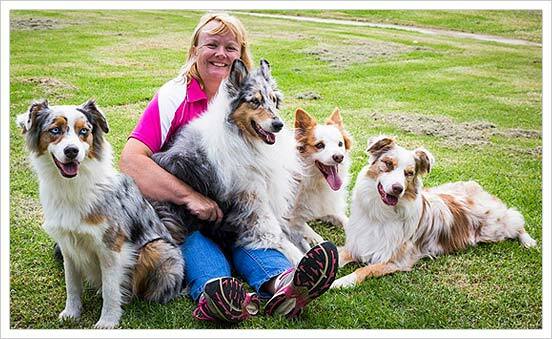 She has worked with dogs for 10 years in puppy classes, grooming and more, is a member of APDT Australia (Association of Pet Dog Trainers). Working as an advisor for KONG Company Australia, along with her dogs, they demonstrate the KONG range and provide information about how KONG products can help reduce problem behaviours such as boredom, barking and general anxiety in our pet dogs. She has a keen interest in dog behaviour and training and regularly attends educational seminars and training courses to keep up with the latest trends in animal training and behavior modification techniques. Our puppy pre-school class is a fun and informative class designed to kick-start your new best friends learning and life experiences. Puppies have critical periods of learning between the ages of 6-16 weeks. The experiences they have during these times will shape the dog’s behaviour and personality for the rest of its life. Attending puppy preschool will help you train and socialise your puppy in a controlled and safe environment, shaping your puppy into a well-mannered member of your family. We strive to build positive relationships between people and their puppies based on trust and effective communication. How dogs learn and the implications of these learning modes for training and living with dogs. Prevention of fear and aggression in dogs – Understanding the importance of bite inhibition and socialisation in preventing aggression. Be able to provide positive socialisation experiences their puppies future development. Behaviour management – Understand the importance of and be able to implement management strategies to prevent unwanted puppy behaviour. Understand what is reinforcing to a puppy and be able to use this knowledge to effect positive training outcomes. Problem solving – be able to apply class learning to problem solve positive approaches to real life situations. Our Puppy Preschool is an “open enrolment” class. Meaning you can start the 4 week course at any time, without wasting precious socialisation time waiting for the next course to start. As long as your puppy has had at least one vaccination, more than 7 days prior to starting the course. Our Standard Puppy Preschool pack – The orientation lessons of the course will be sent to you online where you work through each lesson at your own pace, in the comfort of your own home. Our Premium Puppy Preschool package offers students the ability to have Jenny, our instructor come to your home for a one-on-one class orientation session. This can be a very effective way to “jump start” your learning with your puppy. We can help you with tailored advice to suit your individual needs and home environment on housetraining and successful management of puppy, problem prevention and working on any issues you may be concerned about. This orientation session is a 90 minute visit in your home designed to get your training journey off to the best start possible. Many thanks once again for your care of Jack and Jill while we were overseas. It was very reassuring to know that they were in good hands over the six weeks that we were away.